I had a Tuesday session of Graston’s scheduled, but had an eye doctor appointment that resulted in dialated eyes and no way to get to my session in time. I would have to wait until Thursday for an assessment. I’ve been feeling 100% back, but I needed those devilish implements to really tell the tale. The prodding would bring any remaining injury scar tissue singing. 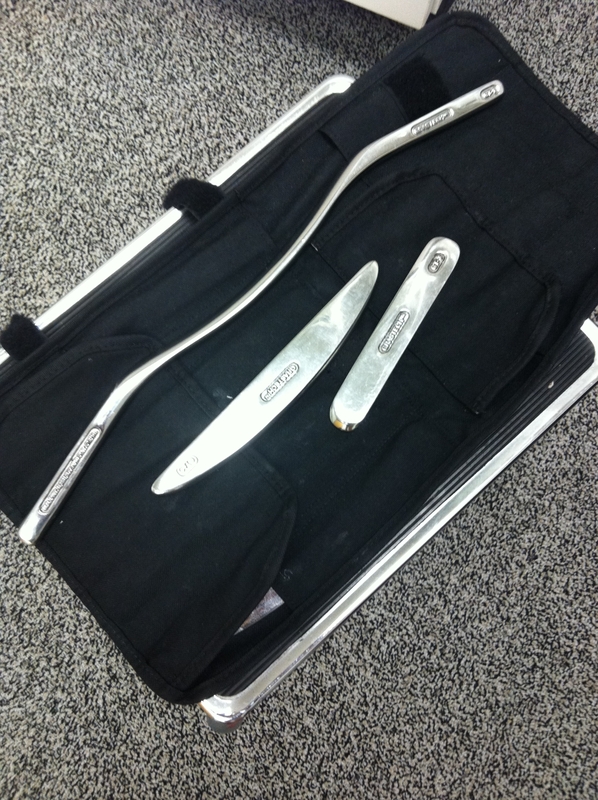 My physical therapist jokes that the tools look like they are right out of the Fifty Shades of Grey series. She felt bad about having to cause pain, but it’s kind of the point of Graston’s. If you are reading the books, please NO spoilers!! I’m still on the second book and let’s not ruin it for anyone else either. If you haven’t read the series, it’s very intense and not for everyone. I questioned my ability to finish the first book, but I’m glad that I stuck with it. There is a part of the writing style (the inner goddess stuff) that I find unnecessary, but overall an intense and captivating series. Categories: Grastons, Injury, Physical Therapy, Recovery | Permalink. 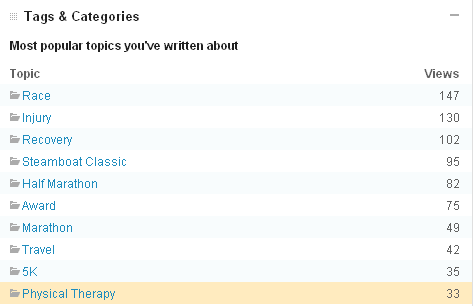 I was doing long overdue blog updates: updating race plans, the about and the races/awards sections when I noticed on my dashboard some metrics that show what topics I’ve been posting about most. So I definitely need some changes on this blog. I would like to have injury, recovery, and physical therapy to not be in my top 10. Although sometimes recovery is just coming off of a big race without actually being related to an injury and is just the maintenance mode. In the future I will categorize the Recovery for those related to Injury vs. Race Recovery, to be more specific. Still, while we are on the topic (and it’s what I’m dealing with right now) I wanted to give an update as how my Graston’s treatments are going, especially because it’s going great! I’ve completed five of seven Graston’s treatments. After my assessment they set up sessions for 2-3 weeks that are 48-72 hours apart (72 hours is the standard length to allow healing, but can be shortened to 48 hours by the PT if healing is sufficient). After each session I have to let the area heal and I don’t work out during that time. I could only do yoga and upper body weights until I got the green light to try some running, once the area was healing. Here is what my workouts/recovery looked like for this time around. NOTE: This is MY experience with MY injury and is not comparable to anyone else’s injury/recovery and is only for informational purposes only. And after Friday’s treatment I was cleared to do more running! I can’t wait! Especially because I got my new kicks!! 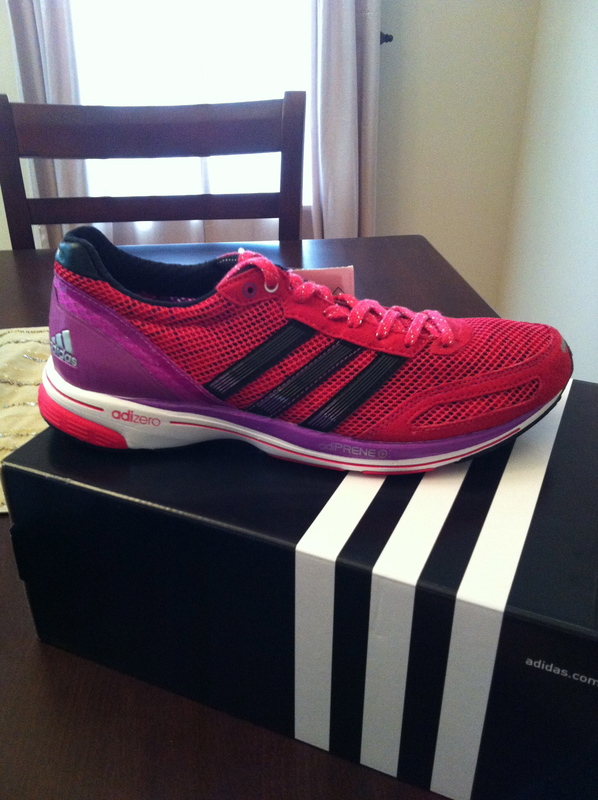 adidas adios, I love the pink with a hint of purple! This weekend the basement project continues, plus I’m painting a couple of our bedrooms and working on cleaning and staining our fence. 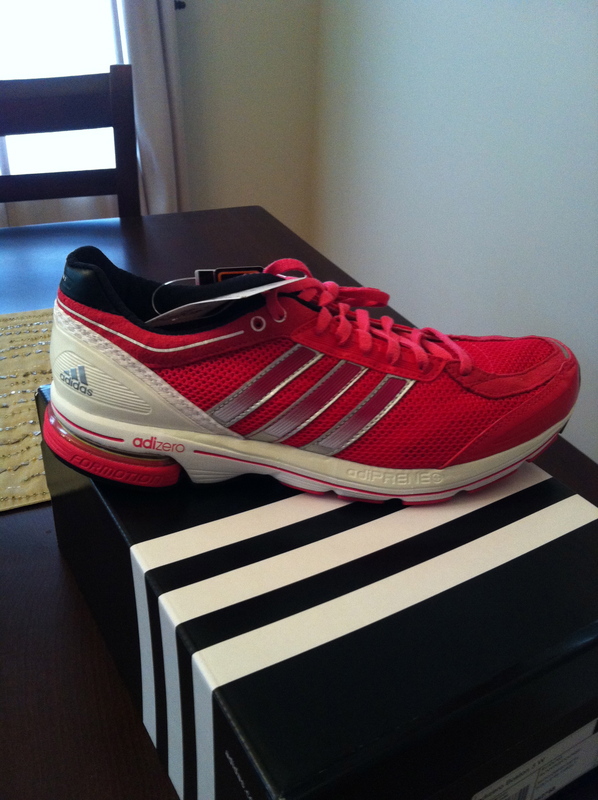 Can’t wait to get to running and everything else! Categories: adidas, adios, Boston, Faves, Grastons, Injury, Recovery | Permalink.